I’m sure the story of Amelia Earhart is compelling. The tale of the first woman to fly across the atlantic, who paved the way for generations of women aviators, and who ultimately embarked on an ill-fated flight around the world, no doubt has to be interesting. The events that shaped her life, the people with whom she was involved, and the challenges she faced throughout her storied career as a pilot are probably thrilling, exciting, and thoroughly engaging. It’s just too bad the movie takes the life of this amazing woman and makes it about as interesting as a carpet warehouse. 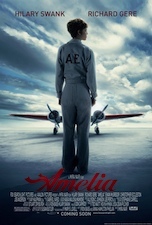 Part biopic, part adventure tale, and part romance story, Amelia chronicles the adventures of Earhart from her days as a child on the Kansas prairie, seeing planes fly overhead and yearning to be at the helm of such a magnificent and graceful piece of machinery, to the final moments of her flight around the world. But a story is only as interesting as its people, and unlike other tragic adventure tales, Amelia unfortunately sacrifices characters and relationships for spectacle and scenery. It is like watching a live-action version of a fifth-grade report on Amelia Earhart, as the experiences she has and people she encounters over her years as a pilot play like a series of bullet points on a fact sheet. Even Earhart herself is poorly developed, and Hillary Swank does her gosh-darned best while suffering through lines of dialog so bad they could have come straight from the George Lucas School of Screenwriting. A free spirit and independent grrl, she eventually fall in love, we are told, with her publicist George Putnam. 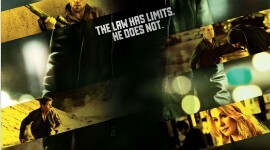 But again, the movie continually violates one of the first rules of storytelling: show, don’t tell. Two characters should not have to continually pontificate about their love for each other–it’s like hitting the audience with a frying pan and telling them explicitly that these people got something goin’ on. Earnart and Putnam, like, totally in love with each other. Midway through the film Earhart, married to Putnam, falls for author Gene Vidal (Ewan McGregor phoning it in) even though the two barely have more than a small handful of lines of dialog together. A awkward tryst in a hotel elevator substitutes for any meaningful emotional connection, and from that moment on we are supposed to just accept the fact that Earhart and Vidal have fallen for each other. 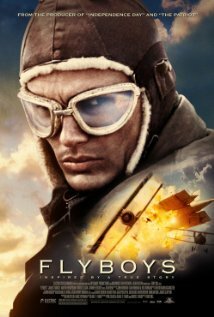 The film jumps from one stage of Earhart’s life to the next with little to carry things forward naturally, and the result is a choppy, uneven storyline that offers little in the way of character development. Not until the final act is any sense of an emotional connection established between the audience and Earhart, and then only because of the impending doom that is about to befall her and her navigator. Throughout the two-hour run time we are treated to many scenes of sweeping vistas and gorgeous landscape panoramas as Earhart travels the globe, hopping from continent to continent and documenting her journeys on an 8mm camcorder like a giddy child. Hillary Swank fits the role well, as does the rest of the cast, but the source material is so poor it feels like the actors all gave up halfway through and showed up on filming days just to collect a paycheck. Even Gere, whose natural charm and infectious charisma can often gloss over a crappy role, gives a lifeless performance. Amelia feels like the shell of a great movie, which is a tragedy in and of itself. A hero like Earhart deserves much better.